experiences as well as taking some time out for plenty of relaxation. Make the most of some of the amazing local wildlife experiences at Leighton Moss RSPB, enjoy the waders and oystercatchers along the shore at Hest Bank and Bolton-Le-Sands, or take in the seals lazing around the Southern tip of Walney Island. Experience the outstanding natural landscape and wildlife of the Forest of Bowland with wide open spaces for you to seek out adventure, or bask in the tranquillity. Take a relaxing stroll along one of the many coastal paths and breathe in the fresh sea air, while you stop for a moment to admire the stunning views across Morecambe Bay. Morecambe is again re-living in its Art Deco past. The iconic Midland Hotel was completely refurbished in 2008, with its fabulous Eric Gill sculptures, unique staircase and entrance hall, where you can enjoy the experiences of a golden era. You can now join Art-Dec themed walking tours, including a visit to the grade II-listed Winter Gardens Theatre, Brucciani’s Café and not forgetting the incredibly popular Vintage-By-The-Sea Festival, held in the town each year. Alternatively, stroll the promenade to the statue of the comedian Eric Morecambe and finish with a sundowner back at the Midland’s Sun Terrace Restaurant, or enjoy one of the superb gin’s from the panoramic windows and sun terrace of the Aspect Bar, while the sun sets slowly over Morecambe Bay..
Visit Historic Lancaster, with its rich history and heritage, famous for the Pendle Witches, Roman, Norman and Anglo-Saxon remains and impressive Castle. Marvel at the Ashton Memorial in Williamson’s Park, that can be seen from miles away, or the Historic Priory and Lancaster’s Catholic Cathedral. Enjoy the Lancaster Canal, from Tewitfield, near Carnforth, through Lancaster, over the beautifully preserved Victorian Aqueduct, then snaking its way through the picturesque villages of Bilsborrow, Barnacre and Bonds. Charter’. His role in convening the meeting between the rebellious Barons and King John and in pursuing the agreement and sealing of Magna Carta at Runnymede in June 1215 was of paramount importance. Barrow-in-Furness is situated at the southern tip of Cumbria, set against the spectacular backdrop of the English Lake District Mountains and on the southern shores of Morecambe Bay with its rich cultural heritage, outstanding natural environment and wildlife. A Victorian built town with a proud heritage of innovation, surrounded by beautiful beaches and inspiring scenery, it is a destination of surprises. The Furness line from Lancaster to Barrow follows the coastline and provides an enjoyable scenic journey of the Bay. Moving a short distance away from Morecambe Bay, you can explore some of South Lakeland’s best-kept secrets. Here you’ll find a fascinating world of towns and villages, much referenced in English culture like Wordsworth’s Grasmere, Ambleside, Windermere, Coniston, Ulverstone, Hawkshead, Walney and not forgetting Kendal, Cumbria has a hat full of hidden gems just waiting to be discovered in this beautiful part of the Lake District. The Lune Valley, has to be considered as one of the most beautiful areas to visit. Close to Morecambe Bay, a trip around the Lune Valley has to be the perfect way to combine coast with countryside. Ideal for walking, cycling or just a leisurely drive, with some stunning scenery to enjoy. And it’s not just about the beautiful views, historically the Lune Valley has been one of the main routes from England to Scotland and has been used over the ages from Vikings to Romans, amongst many others. A visit to Grange-over-Sands is the perfect way to combine a leisurely stroll around a traditional Victorian seaside town with a small hike over a striking, but low, fell. Hampsfell stands at only 220m high, yet it boasts some of the finest views of any fell in the Lake District. On the top of Hampsfell is the Hospice. This solid stone shelter was built in 1846 by the vicar of Cartmel and is the ideal place to shelter from inclement weather. Above the door is a Greek inscription which apparently reads “Rosy-fingered dawn” and seems to puzzle many people but maybe it’s because it faces East and, therefore, directly into the rising sun. Inside the Hospice are several other inscribed panels telling you more about the history of the site. The village of Warton is a great place to go and sample some unexpected history! Close to Carnforth, the village was first recorded as a settlement in the Domesday Book, written in 1086. Warton has connections to the first President of the United States, George Washington. Washington’s ancestor of seven generations, Lawrence Washington, is rumoured to have helped build the village church of St Oswald and the pub in the village of the same name has historical connections with George Washington, historical President of the USA. A substantial water powered corn mill, with the last major rebuild on the site being in the 1770’s. The Mill and adjacent buildings have been restored by the owners, Mike and Vicky Brereton, to provide public access to a working water corn mill, Dusty Miller’s tea shop, Pig’s Whisper Country Store, and a converted pig sty – now a holiday cottage. Characteristic of the Cumbrian rural landscape, this imposing watermill and site has been part of the local traditions for over 400 years. Located close to the ruins of Gleaston Castle, the present building dates from 1774, with the impressive wooden gearing being original to the 1700s.Visitors to the mill can see the 18 foot waterwheel, impressive wooden machinery and many displays and artefacts. There has been a ferry service between Knott End and Fleetwood since before records began with the first ferries operated by fishermen who took passengers across the river as and when required. The first official ferry service began in 1894 and continues today with the Wyre Rose operatedby Wyre Marine Services. 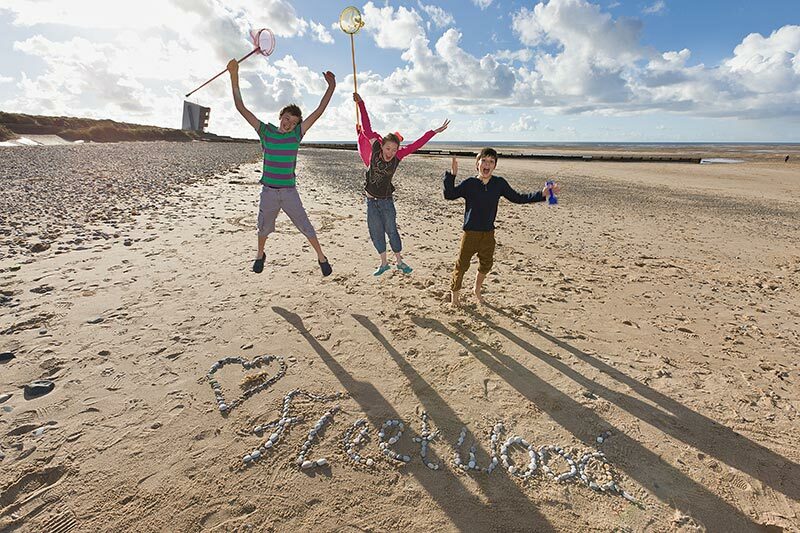 The Fleetwood to Knott End ferry service provides a vital link for visitors and locals between Fleetwood and Knott End. The ferry journey takes less than 10 minutes. Home to one of the largest Buddhist communities in Europe. 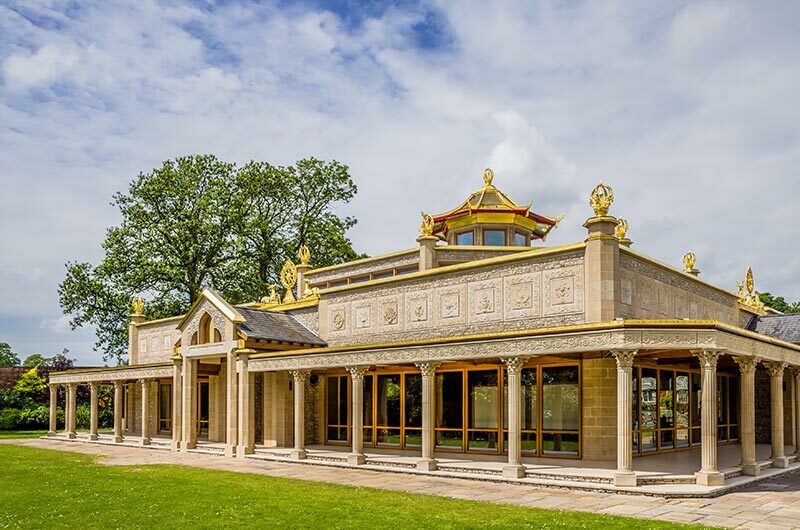 The Buddhist temple and historic mansion are set in 70 acres of woodlands and parkland next to Morecambe Bay. There is a Cafe with indoor and outdoor seating and guided tours are available. Open to the public so that visitors can learn about the coastal environment, bird life and plant life, or just come and enjoy the view. The ground floor gallery has information about the local area and seasonal displays. There are two observation decks for bird watching and taking in the views over the beach to the Irish Sea and across Morecambe Bay to the Lakeland fells and the Forest of Bowland. Anyone who is not able make it to the top deck will be able to enjoy the view through a screen at ground floor level. A specially commissioned artwork ‘Drift’ features throughout the building and is made up of a series of individually designed pieces fashioned from natural materials and textures inspired by the natural patterns from the coastal environment. The burial site of a dark-skinned cabin boy or slave, on unconsecrated ground in a field near the small village of Sunderland Point, near Heysham and Overton. Sunderland Point was a port, serving cotton, sugar and slave ships from the West Indies and North America. Sambo had arrived around 1736 from the West Indies as a servant to the captain of an unnamed ship: It has also been suggested that Sambo may have died from a disease to which he had no natural immunity, contracted from contact with Europeans. 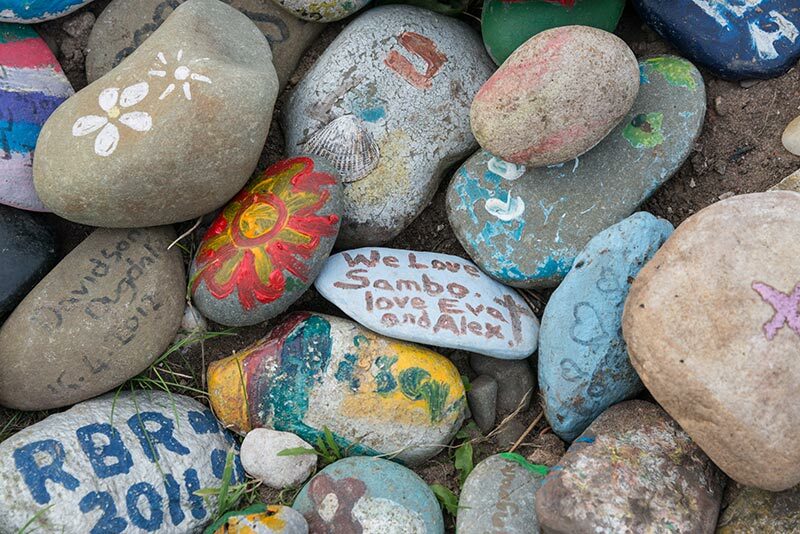 Sixty years after the burial James Watson, heard the story and raised money from summer visitors to the area for a memorial to be placed on the unmarked grave. Watson, who was the brother of the prominent Lancaster slave trader, William Watson, also wrote the epitaph that now marks the grave. The skilfully constructed tall chimney of limestone which stands on the shoreline at Jenny Brown’s point is the only remains of a copper smelting works established at the end of the 18th century. One of Lancashire’s most beautiful coastal areas and the perfect spot to enjoy the amazing vistas in this AONB. Elizabeth Gaskell wrote some of her novels from a tower overlooking the sea. The story of the Bobbin Mill is brought to life with a brand new exhibition. Visitors can also see the journey from tree to bobbin first hand during production on the original belt driven machinery. A hands-on family trail helps visitors to imagine what it was like to work at the mill. Although small, compared to other mills, some 250 men and boys (some drafted in from workhouses) worked here over the years in often arduous conditions to produce a quarter of a million bobbins a week. Located in the Lake District, this extensive working mill produced literally millions of wooden bobbins vital to the Lancashire spinning and weaving industries. Nicky Nook is a real hidden gem and a popular vantage point on the outskirts of Scorton with amazing sweeping views from the summit. The Wyre Way is one of the best ways to check out those views, by pulling on your walking boots and enjoying all, or some of the 46-mile walking route throughout rural Wyre. For the less adventurous, there are some shorter circular routes, with lots of pubs and restaurants to put your feet up along the way.